We had 18 hikers on Saturday's hike to La Madre Springs. 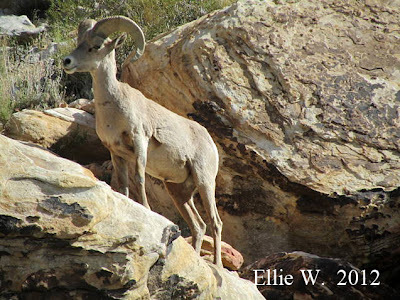 We encountered 5 big horn sheep, 3 burros and one coyote. We had a leisurely hike filled with interpretive moments with numerous hikers participating in plant identification. We had new hikers who treasured the slow pace and learning. (A nineteenth hiker hearing about our intended pace abandoned us at Best Buy. We saw this hiker on the way back. This hiker went all the way to the mines above the cabin.) The rest of us made it to the springs. We had a magnificent day as the weather was great as was the camaraderie. 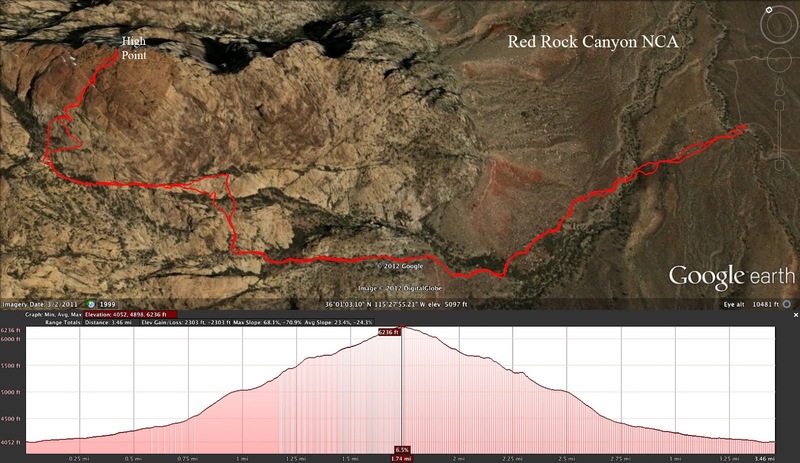 Today's hike around the Blue Diamond Bike Trails morphed into an additional 2.5 miles with a jaunt out the ridge to the Blue Diamond Cactus Garden. Thirteen hikers politely followed the coordinator with varying amounts of enthusiasm for the lengthened morning. 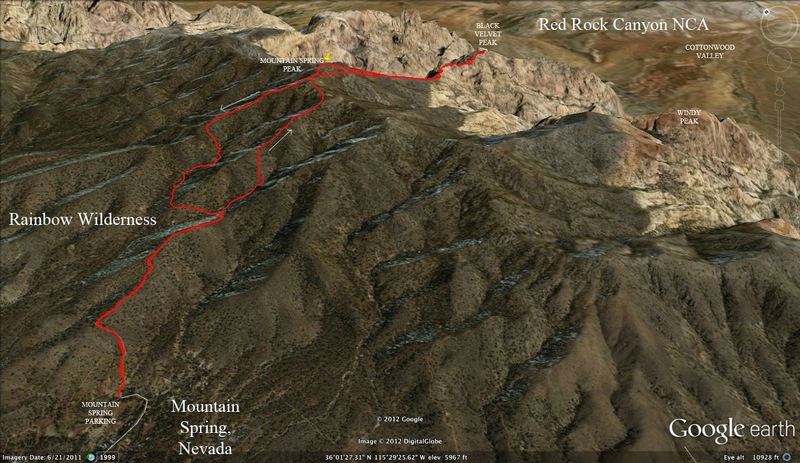 Although the hike ended at 7.75 miles, the easy terrain made the moderately paced hike only 3.25 hours long, beginning and ending in the parking lot at the top of the Blue Diamond, Nevada community. We started the Blue Diamond Bike Trails hike on the usual route passing by the Spanish Trail marker as we made our way over to Highway 160. Rounding the bend, we began our zigzaggy climb up to the ridge above Blue Diamond. With Don's help, we found the trail that leads along the ridge to the cactus garden which turned off around the 3 mile mark. Don led the way over and up to the garden. 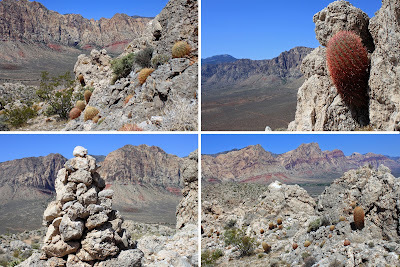 By the time we got to the cactus garden, a break was well deserved so we meandered among the cactus barrels and craggy limestone while munching and drinking and photographing. Soon, it was time to return to the main trail and find the cars. 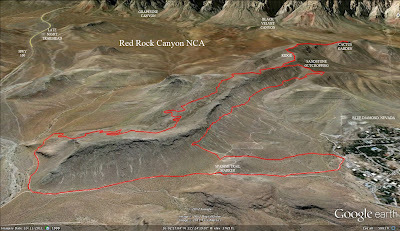 We hiked back over the ridge with magnificent views right and left, then turned left onto the loop again. Right away, we saw a collared lizard pictured to the left. To return to Blue Diamond, there is a route north of the wash and one south of the wash. We took the sourthern route that is high up under the cliff. Very often, there are burros in this area. Sadly, there were no brayers within sight. Finally, we came down the hill and worked our way over to the cars. The net elevation gain for this rolling hike reached 1300 elevation feet on a gorgeous warm day with a fair amount of cool breeze. Parking at Grapevine Canyon below Windy Peak. Beaver Tail and Hedgehog cacti were in bloom. 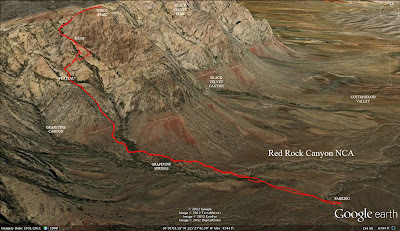 Eleven hikers braved the Las Vegas heat again to climb 2000 feet in elevation over the short course of less than two miles in the southern part of the Red Rock Canyon NCA escarpment. 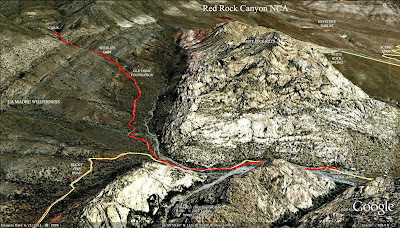 The final destination would be the well-known Windy Peak which lies just north of Hollow Rock Peak and just south of Black Velvet Peak. 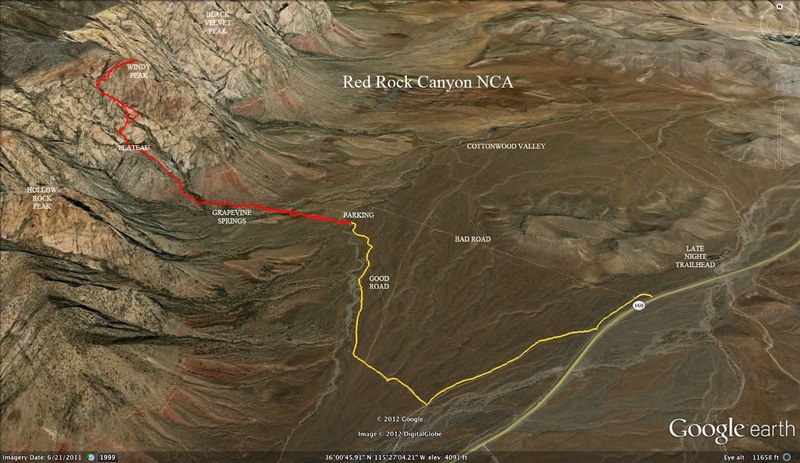 Three high clearance vehicles took the hikers over the approach road to a small parking area just east of Grapevine Canyon. We crossed over the desert terrain until we happened upon the trail somewhere near Grapevine Springs, a fenced area where protected springs flow. 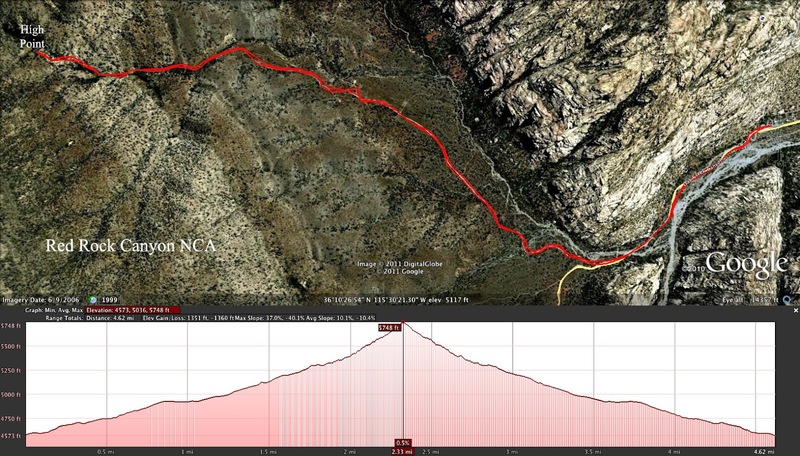 Without stopping, we continued along the trail gradually ascending to the base of the first steep ascent. The weather was already getting warm and there was very little breeze. Tackling the first steep ascent. The climb was brutal and relentless in the heat. The footing was loose and every step had to be judged. When seven hikers had already passed through the coming plateau area and begun the second ascent, three hikers had waited back for a fourth hiker (moi) to finally make it up to the plateau. The heat was proving to make the writer's day end here and the three hikers did an excellent job setting her up for a two hour wait in the shade of a juniper. Truth be told, the writer was quite happy exploring her abode during the wait. 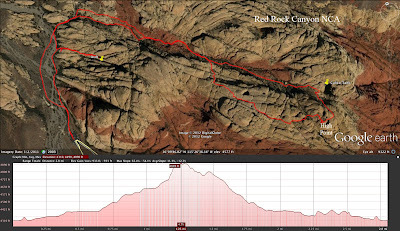 As the writer caught her breath, she watched as the other hikers climbed up the sandstone in a switchbacked direction to the ramp and on to the saddle. At the saddle, they disappeared around the corner. Radio in hand, she heard the group check in at the summit about an hour later. A panoramic photo of Windy Peak from the plateau. Briefly, the writer wishes to described her surroundings during the wait. To the left is a photo of her view from underneath a juniper tree. Above is a photo of Windy Peak from her vantage point. The view of the escarpment continued around to the left in a horseshoe shape until the eye reached Hollow Rock Peak where she could see the exact rocks where that hike terminated. The view of Cottonwood Valley below and beyond was slightly hazy but peaceful and very quiet. 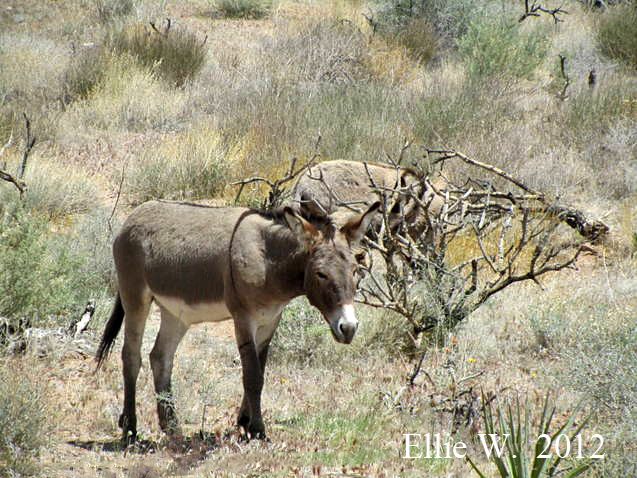 After a two hour rest, the writer had not seen any wildlife with the exception of a ground squirrel. Until ... one hiker made his way to the plateau from an unexpected direction. The other hikers who had descended the same way they went up were, at that time, just coming down the ramp. The two of us watched from the top of a nearby rock outcropping as the rest of the group came down. With just a small break, we all stepped over the edge and began the slippery dirt and rock descent. There were a couple of bad falls but we were all still walking as we reached the canyon then the springs, then the cars. 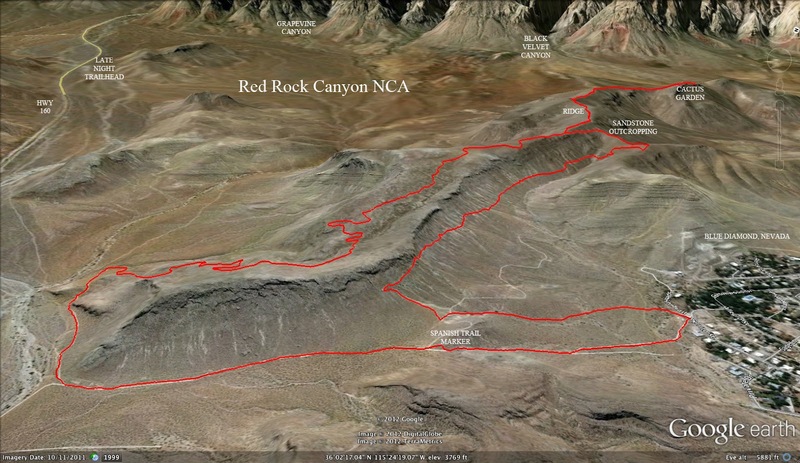 This hike is definitely a challenge and is well-rated at very strenuous. Back to the hot desert Cottonwood Valley. Mike, Richard and Larry provided this report on today's hike to Black Velvet Peak in the Red Rock Canyon NCA escarpment; one peak north of Windy Peak. Thanks guys! Monday hike, Tuesday pace. Two minutes out of the car and the decibel level was at zero. The steep terrain combined with the brisk pace inhibited all conversation. It was the back door route to Black Velvet Peak, starting from just beyond the Mountain Springs Bar. On a day when valley temperatures would reach the upper nineties, Richard Natale hosted a group of 11 rambunctious hikers. 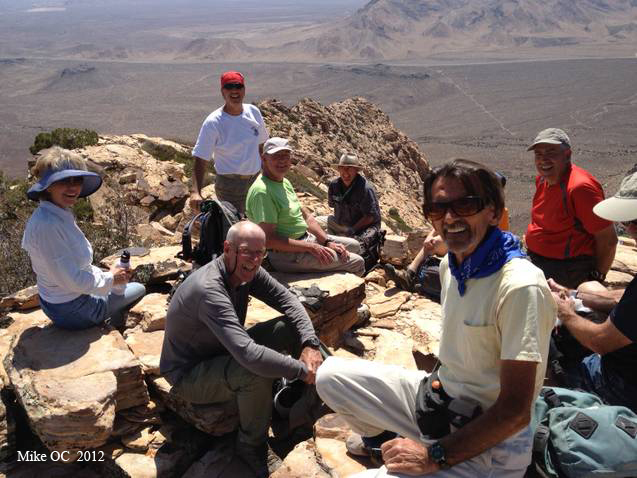 The one-hour mark found us standing atop Mountain Springs Peak. After the obligatory photo and sign-in, we began our steep descent to the Black Velvet approach. Sandstone "Fun" on way to peak. Sandstone at last! Monday hike, Tuesday fun. Ditching hiking poles and donning gloves, it was time for the crux of the hike, the steep third class scramble to the summit. Five minutes later we came to an abrupt halt, as we all gazed down into the steep abyss. Is this it? Turnaround point? Perish the thought. Richard, a la Lewis Carroll, pulled a rabbit hole out of his hat and up we went single file. Thirty minutes later, we all stood atop the summit. An absolutely magnificent view of the southern portion of the Red Rock escarpment. And where do 11 tired hikers adjourn to at the end of a tough day in the mountains, you might ask? Why, the Mountain Springs Bar, of course. Monday hike, Monday beer. Red Cap and Turtlehead Peak from connecting wash.
Twenty- seven hikers showed up to challenge the Las Vegas heat on a hike in the Calico Hills of Red Rock Canyon NCA. We were dressed for the temperatures to be in the high 70's and everyone had plenty of water. 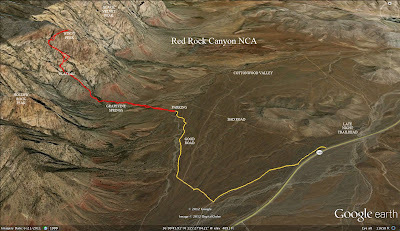 So, after we assembled at Sandstone Quarry, we took off down the Calico Tanks Trail. Every chance we got to stop in a little shade, we did, and eventually, we reached the main Calico Tank in the usual way. The tank was completely dry but we didn't go there for that. View through sandstone to North Blue Diamond Hills at top of wash.
From the large dry tank, we turned right to go up hill to a wash that connects this area to the Calico II Overlook Peak. One by one, we negotiated our way up the difficult wash scramble. 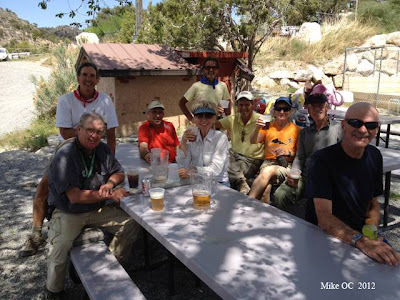 The coordinator wishes to thank Mike and Don (and others) for all their help this morning as they swept the long line of hikers and offered their help in getting up difficult places. The hikers were enjoying their challenges and the fun was only now beginning! At the top of the wash, we turned right and climbed to the top of the sandstone where we took our morning's break. View of Las Vegas Strip from top of Overlook Peak. We wanted to stay up on the hill all day but, alas, we needed to continue so that we were not still out here during the hottest hours. The view was amazing and a few of us even found a shady spot down below the peak. 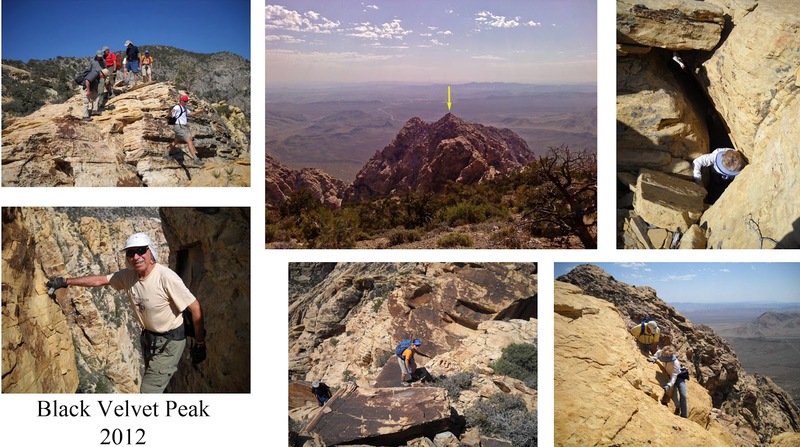 After the break, we continued in the same direction as before and began a reverse hike of the Tank Discovery Scramble. This portion of the Tank Discovery hike is found in the second phase of that hike where there is a crevice filled with brush, boulders and fallen trees. After climbing this fun part, we were up on a sandstone plateau. 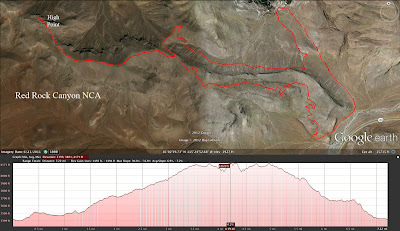 We crossed the plateau and began a descent that became steeper as we went. The final part of the descent back down to the Calico Tanks Trail was very steep but all hikers were on board with no balking! This section of the hike was new to most of the hikers and it was agreed that, not only was it enlightening as far as what was up there all this time but it was also super cool! Guy scrambles through a redbud tree. 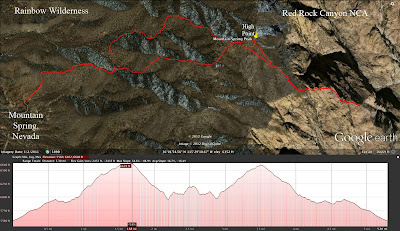 We merged back onto the Calico Tanks Trail just above Mass Production Wall and after taking another rest, we continued until we reached a large boulder in the trail. 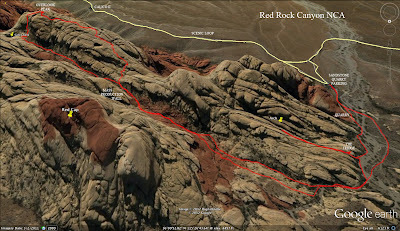 Here, we forked to the right and chose to make the return on top of the sandstone instead of down in the sandy wash. There were a couple of interpretations of this part of the hike. When we were almost back to the Turtlehead Peak Trail junction, we decided to take a small side trip to see a nearby arch. Most of the hikers were game and the others went on back to the cars on the well known trail. At the arch, we noticed that the canyon below was filled with blooming redbud trees. After much admiration and visiting "The Refrigerator" tunnel, we returned to the cars via the old quarry route. We had hiked three quality miles with an elevation gain of 500 feet. Redbud tree and white sandstone.